I was getting into the car after our walk in the country park when I saw this huge yellow tractor coming towards me spraying the field. Wonderful I thought for the rainbow. When I put the image up on the PC all I could see was very green grass and a very blue sky! LOL! Topaz helped me out but I am not sure about the finished image. No time for anything else today as we are waiting for a surveyor to come to measure up and give us a quote for artificial grass in the garden. We have no grass left and the boys are continually bringing in mud, mud and more mud!! I am looking for a solution!! Many thanks for putting my gerbera on the PP - lovely to see it there. 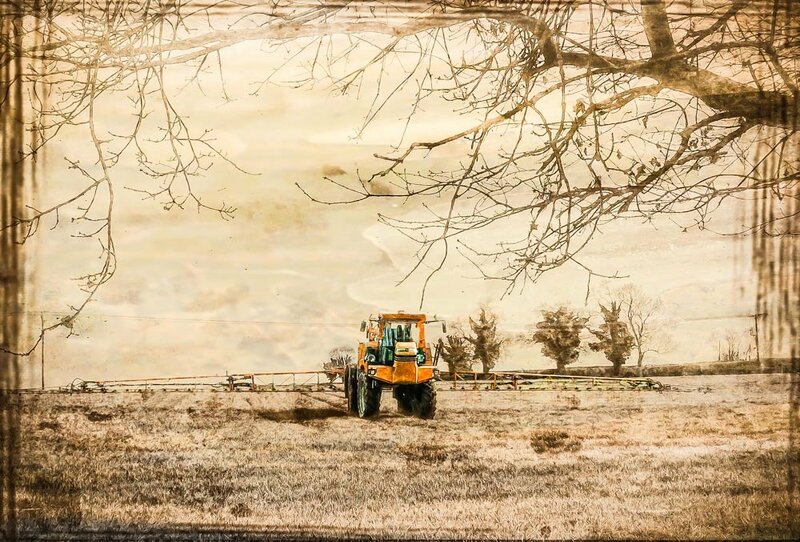 the edit works really well, and i like the detail on the tractor - nice complementary colours the farmer chose! Great faffing! Good luck on your artificial grass quest! It very well may be a good solution for you and the boys. Love the vintage feel with the modern tractor!! I love the editing, what a great shot. fav. I think it's super. Great editing! I think it is very unique. I like this shot and way you've processed it Pam, makes for a very interesting image. I really like what you did in Topaz. The tractor really grabs you right away. FAV!